Corporate Council on Africa (CCA) and the U.S. Africa Business Center (USABC) convened a high-level U.S. business delegation meeting with H.E. Muhammadu Buhari, President of the Federal Republic of Nigeria at Blair House. Corporate Council on Africa (CCA) and the U.S. Africa Business Center (USABC) convened a high-level U.S. business delegation meeting with H.E. Muhammadu Buhari, President of the Federal Republic of Nigeria at Blair House. 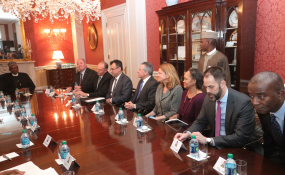 Senior executives of AGCO, Boeing, Chevron, GE, Lockheed Martin and Procter and Gamble, joined by Florie Liser, CCA President and CEO, and Scott Eisner, President of USABC, discussed U.S.-Nigeria business opportunities and ways to promote greater U.S.-Nigeria trade and investment. Participants discussed investments and existing and potential projects in a range of sectors of vital interest to Nigeria, including agriculture, aviation, security, infrastructure, and manufacturing, as well as the policies needed to facilitate business and incentivize further investment in those sectors. CCA, the leading U.S. business association focused solely on enhancing U.S.-Africa business relations, remains dedicated to promoting trade, investment and business engagement between the U.S and African nations, including Nigeria. About 15 percent of CCA member companies are African, and Nigerian firms make up almost 50 percent of that number. CCA also has a satellite office in Abuja, which is led by Mr. Ekenem Isichei, Director for West Africa.